I saw this wreath on my neighbor's door and I begged her for the "how to". I thought it was so cute and looked a little Debbie Mum(ish). 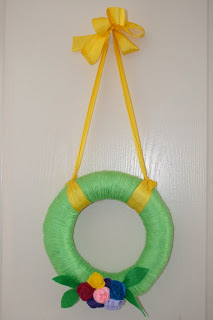 The best thing about this wreath is that it is easy to make and you can use any colors to fit your style...or holiday. All you need is a straw wreath (with the plastic left on) a skein of yarn, 4 or 5 colors of coordinating felt, a glue gun and some fabric scissors. Wrap your wreath with the yarn. Wrap it as close as you can and wrap the yarn over it again where the straw peeks through. Cut your felt continuously in a circular shape. If you want your flower to have "petals" cut your felt with little waves like this. You should have one continuous piece of wavy or non-wavy felt. The thicker your felt strip, the taller your flower will be. The longer your strip, the bigger your flower. The bigger the waves, the bigger the petals on your flower. You get the idea. Just play around with the felt until you get 5-7 flowers. Starting at one end of the felt strip, roll the felt tightly into a circular direction until all of the felt strip is used. Fold the very end of strip under your flower and secure with hot glue and a felt circle to keep everything in place. These are the flowers I made for my wreath. Then I cut green leaves from green felt and attached them all to the bottom of my wreath with hot glue. I attached a 2 inch ribbon and hung it on my door. It was so easy to make I'm thinking about making an orange, purple and black one for Halloween. 0 Response to "Debbie Mum(ish) Wreath"